If you are reading this, you are probably aware of INTERNeX’ weekly PuB NiGHTs. Every Wednesday, we visit another pub and the day after, we write a blog post about the night. So, that’s what brought me here today. Yesterday, it was time to reunite at a pub we had’t visited in months: Malone’s. As always, we walked into the pub and told the waiter we had a reservation for INTERNeX. And that’s where the first thing went wrong…: We arrived at our tables and as always, there was a ‘reserved’ sign. However, instead of ‘INTERNeX,’ it said ‘Increnex’. I mean… potayto, potahto. Well, not really. But oh well, we forgive and forget. We sat down, looked at the menu and ordered our first drinks. Personally, I like to start off a PuB NiGHT with a Baileys Coffee, before I order the drink I’d like to call I-do-not-really-like-you-but-you-are-the-cheapest-drink-on-the-menu: beer. After some time went by, more and more of you came to join us on this lovely, sunny evening. Every time someone arrived, and after a casual “Hi! How are you doing?”, we – gently – held a Rocky Mountains flyer in front of the person’s face. Why? Well, this is the destination of the monthly weekend trip in August and we do not want any of you to miss out on this amazing adventure! Since the trip is happening in a little more than three weeks, it was one of the main topics last night. Alongside, of course, this month’s trip which took place last week: Vargas Island. I had to miss out on this one, which is why I loved hearing all the fun(ny) stories you all told me. Especially the one about Stefan’s mat going missing while Samuel was living a luxurious life. When we finished talking about trips, shopping and work, it was time for some action. Let’s play: Cheat! Yes, you read that correctly. ‘Cheat’ is a card game, the aim of which is to get rid of your cards. In order to do so, you have the option to lie about the cards you’re playing. However, if someone thinks you are lying and they are correct, you have to pick up the entire pile of cards. If you spoke the truth, they get the pile. As you might guess, it was a fun game that included lots of laughter. Considering we stayed at the pub until midnight, when it closed, ‘fun and lots of laughter’ described the night itself. I hope you all enjoyed it as well. I hope to see you all this Sunday for our Grouse Grind hike! The camping trip is only 2 weeks away! Here is another blog to get you totally ready for the trip! This time I will inform you about the activities you can do on the Saturday. There are a few things you can do in Tofino itself. Tofino is known as one of the best surf spots of the world, so when you are there you should definitely try out surfing. There are several surfing schools on the island, so don’t let your lack of experience hold you back! As it is an island, it is perfect for other water sports too such as kayaking and stand up paddling. If you would rather explore Tofino by foot then you could go for one of the hikes around the town, for example the Rainforest Trail! First of all, Tofino is known for its whale watching tours. During March and April there are lots of gray whales migrating from Mexico to the north. In May till November there are over 200 gray whales that stay in the waters next to Vancouver Island. Between June and September they have the highest sightings of Humpback whales. So there is a lot of chance that you will see whales if you go on a whale watching tour during our trip! There is also a hot spring close to Tofino. If you want to do this tour you even might be able to see some wildlife. When you arrive at the dock in Hot Springs Cove you will first walk through a rainforest and on the end of this walk are the hot spring pools, a waterfall and some great views of the Pacific Ocean. Meares Island is an island close to Tofino and Vargas Island. There are two hikes on the island. The first hike is the Big Trees Trail. This trail will lead you through world’s largest Western Red Cedar Trees on a boardwalk. The second hike is for more experienced hikers. This hike will get you up the Lone Cone Mountain. It takes around 4-6 hours to go up the mountain and back. I hope I informed you guys enough about the activities. Next week there will be an update about the schedule! If you would like to know more about the camping trip, then check out our event page. There is only one more week to sign up, so come by the office and sign up to ensure your spot! In the weekend of the 9th of June till the 11th we will go on a trip to Vargas Island and Tofino! With the following tour guide blogs we hope to inform you more about the places we will visit, the activities and the schedule. During the weekend we will camp on Vargas Island. A water taxi will take us there from Tofino and we will set up our camp on one of the campsites for the following 2 nights. 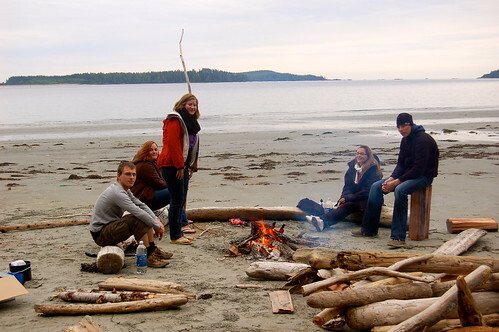 On Saturday we will go back to Tofino for one day to do some activities. Vargas Island is a Provincial Park close to Tofino. The park contains 5788 hectares of land. It has 3 amazing wilderness campings, two at Ahous Bay and one on the north beach of the island. If we are lucky we might even see whales pass in the distance. The Ahous Bay has a west-facing beach looking straight out at the Pacific Ocean. Vargas Island is home to wolves. The wolves are used to the people, but food must be stored out of reach. Tofino is a small village on Vancouver Island. It is a really easygoing and friendly town with only around 2000 inhabitants. The village is a big tourist destination in summer and it attracts lots of surfers, hikers, campers, whale watchers, fishermen or just anyone looking to be close to nature. Tofino was even named best surf town in North America in 2010. As Tofino is part of the Pacific Rim National Park, there are also lots of hikes around the village. I hope I informed you guys enough about the places we will visit. Next week there will be an update about the activities! If you would like to know more about the camping trip, then check out our event page. INTERNeX HiGHLiGHTS 2, shows it all! Watch this video and listen to our beautiful voices during the last Karaoke PuB NiGHT! We also had big changes in our PR-Team – we are very happy to welcome Katie in our office. At the same time it’s so sad to let Maria go back to Germany. And of course our Vargas Island adventure is still fresh in our memories! Check it out! Thank you to everyone who liked and commented on our winning picture of our ‘Most LiKEable picture’ contest! This picture truly captures one of our most memorable moments during our INTERNeX Vargas Island camping trip. Sitting by the fire, enjoying the warmth and the great company really made it special. Do you want a chance to win a great prize? Send us a picture that you think is worthy of being our picture of the week to pr@internexcanada.com! !